The most popular (and easiest) trip is to launch at the Willow Creek Canoe Corral on George Johnston Road and exit at Edenvale Conservation Area (Hwy 26). There is a technical “narrows” section about half hour into the trip – follow the staked arrows to find your way – the creek branches here and you can get lost/stuck if you take the wrong branch. Many people get lost in the Willow Creek marsh – it becomes lake-like and you lose the creek channel. The “re-entry” point (where it enters the silver maple swamp near the Nottawasaga River) is at UTM 589089 4918425 (Lat/Long is 44.414226 -79.881549). From there, the creek channel (and tree markers) should be visible – water levels are lower once you hit the main river so just follow the river down to Edenvale. Please note that windy conditions can make the Willow marsh very challenging/unsafe (whitecaps). The Nottawasaga River (Angus to Edenvale) is also navigable; however, there are significant log jams (up to a couple hundred metres in length) that may require portaging – and very slippery banks to ascend. The Mad River route is navigable but be prepared for small log jams/tight squeezes/short carry arounds. The river opens up as it approaches the Nottawasaga – similar to Willow, it can be a lake during the spring freshet with no clear reference points (and attendant dangers). The “re-entry” point (where it enters the silver maple swamp is at UTM 587350 4917146 (Lat/Long 44.402254 -79.903071). 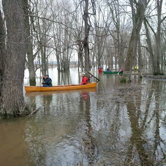 Please note that the Nottawasaga River often backs up into the Mad River at this point – in these conditions you actually have to paddle upstream (north) to get to the Nottawasaga – though you’re sure you should be heading downstream! People get lost in the Minesing Wetlands every year – it is important to have a compass and GPS and be familiar with their use. And ensure you take all safety precautions i.e. all safety gear, clothing for the weather and extras. Plan the paddle and paddle the plan and ensure that someone (outside of the tripper group) is aware of your plans. The wind can be a real safety concern in terms of potential for capsizing and exhaustion and we highly recommend checking the wind forecast before you embark. Be safe and enjoy – it’s a fabulous spot! Categories: Canoe, Paddle, Trip | Tags: GPS, Minesing Wetlands, paddle, trip | Permalink. Passionate in his beliefs, always speaking from the heart, his films inspired many people to dedicate themselves to the enjoyment and conservation of Canada’s wilderness and waterways. By taking part in the festival, it is our hope that you will be encouraged to become more involved with the protection and conservation of our unique Canadian wilderness and waterways. Categories: Canoe, Paddle, Photography | Tags: Bill Mason, conservation, FOMW, paddle, wilderness | Permalink. Willow Creek Canoe LaunchThe Willow Creek Canoe route access point where the Willow Creek crosses County Road 28 is a popular and busy site. The banks of the waterway are slippery and the current fast, so the launching of canoes can be difficult. The construction of a canoe launch dock was undertaken in 2003 through the efforts of a local environmental consulting firm. Categories: Canoe, Tour | Permalink.